Edit: Berry I think we should keep the Falkar Foothills brownish layout for a much larger chunk of land than what the old snow cell southwest of Mt. Snowhawk suggests. Increasing frequency of snow patches and the real snowline starting in Falkirstad. Sounds good. Dirt, snow-dirt, dry grass and more and more pines. So basically, while trinkets of snow would start to appear in Foothills region, truly snowy landscape would arrive a little bit more north, like this? By the way, something to keep in mind when considering a temperature of SHotN areas. A steam-breathing, a feature of Blood and Gore mod, begins in the line of the cell with ferry, south of Markarth. It's based on the snow line of Solstheim, I guess? Anyway, I think those would be proper outlines to follow. Another thing, I wouldn't mind a few regular pine forest cells on this mesa. I mean, more heavily forested than the other mesas. Oh yes please. And a Reachman sacral grove (clearing?) within it. So basically, while trinkets of snow would start to appear in Foothills region, truly snowy landscape would arrive a little bit more north, like this? It should be the other way around with the snow line starting at that same spot in the east but going northwest from there so it starts a little bit north of Cascabel Hall and Falkirstad. I'm also against snow on that mesa. The whole western Reach is supposed to relatively temparate, while your proposal would turn it into a snow waste. Edit2: We cannot really take your third party mod into consideration. 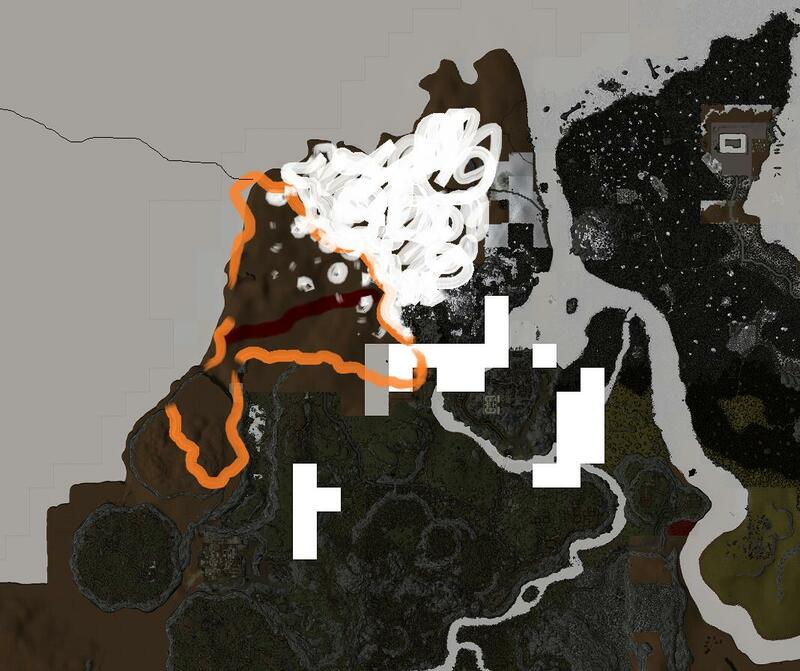 In central parts of skyrim the snowline will probably be further south than that and you will have cold and snow down in the Jerall mountains or along the whole range of the Velothi mountains anyway. @Roerich: That snowline is too vertical to appear believable ingame, I fear. Take it with a grain of salt, the arrow and snow patches should give a better picture. But I'm not opposed to making the entire coastline snowy. This term, "snowline", is a bad one to start with (in this context). The transition should be gradual as roerich pictures it, though perhaps it shouldn't extend this far to the south. If I remember correctly, the idea was to have a few larger hills in the Falkar Foothills. We could add minor patches of snow where the elevation allows for it in this area, with actual snow plains starting to appear further in the north. Perhaps not as frequent as roerich has visualized it. I suppose we can compromise by keeping the mesa free from snow. The verticality on roerich's transition is something I'd worry about too, and I believe it was a design flaw in the vanilla Grazelands. No worries, I just thought that the east-west thaw and the resulting vertical snowline was something that we had agreed upon when we conceptualized this region. I'm not particularly attached to it. I also have the more nefarious thought that barren and hilly plains with large patches of snow would be easy exteriors to finish, finally giving us the possibility to move east. 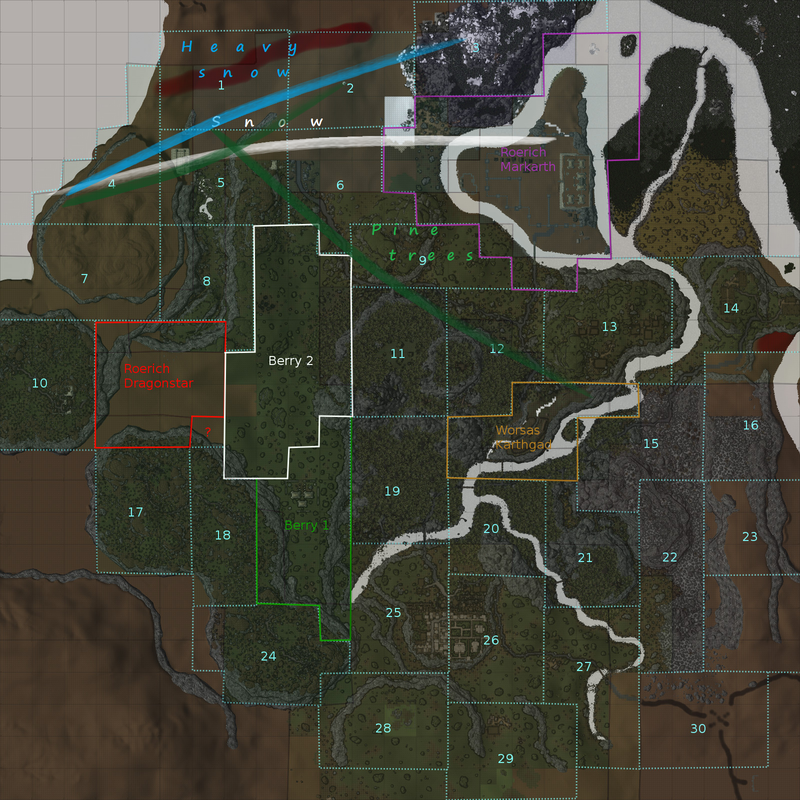 This area should feel mostly isolated and empty, with Vabrencul, Cascabel, Reachman camps, Nord-Breton fishing villages and Fort Northwatch being the main points of interest. Well, I don't mind setting the "snowline" more north, especially since everyone else seem to prefer it that way. In fact, recently I've been thinking about Hammerfell border area (I'll try to post my thoughts and proposals this evening) and how sultry it feels, so it makes sense to have as much of a landscape spreading between it and a snow as possible. I agree with the Grazelands point, snow range should be curvy, bent one way or another. I write this having absolutely no knowledge of how you plan landscapes, nor what you've already agreed on. I came across this and just wanted to add a different perspective. Scampy is correct in saying that "snowline" is a bad term to start from. A treeline looks like a line only from a distance. There is a gradient from closed forest canopy to treeless alpine tundra. The primary causes of this are temperature and water availability (tundra, as opposed to alpine tundra, would have the permafrost problem preventing tree growth). The higher the altitude, the thinner (the more spread out the gases are) and colder the air becomes (the gaseous molecules bump into each other less and the lower density means they absorb less solar radiation). This resulting cold also ensures there is no available water for plant growth (being trapped as snow & ice) until the angle at which the sun shines allows melting. Why am I going on about this?? From a landscape design perspective, thinking about altitude and latitude can only make the end product feel more natural [for the game world], by ending up with more variation between different areas & regions that would otherwise be identical (especially the case with the mountainous/taiga mono-culture of Skyrim proper [I differentiate between the Reach & Skyrim] [although, mono-culture is also a bad term considering the diversity that exists between eastern & western Siberian taiga]). To further diversify landscaping, there is usually a lower treeline on northern slopes (in the northern hemisphere) due to a shorter growing season (shade means ice takes longer to melt, less time for plants to use water). High wind is another factor that keeps water availability down at high altitude, as well as eroding soil, both of which makes it difficult for plants to colonise. It can also have the effect of keeping ridgelines snow-free, while a snowfield would be found on the leeward side of a ridge. Again, I hope you take this as a constructively different perspective, that may help inform future plans. Last edited by dobren on Mon Jan 15, 2018 11:29 pm, edited 1 time in total. Your input is, of course, much appreciated and helpful. Right now I don't have any plans to include snow on the northernmost mesa. In any case, like you said, I should take into account altitude and other geographic aspects when adding snow in these areas. Generally though, we should probably try not to push too hard when it comes to real life accuracy when there is a chance it could limit the creative freedom in our world building. In the context of video games, I like to use the term "realism" as a means to describe an absence of elements that contradict the inner rules of a world. I don't believe players will wonder too much about misplaced snow. 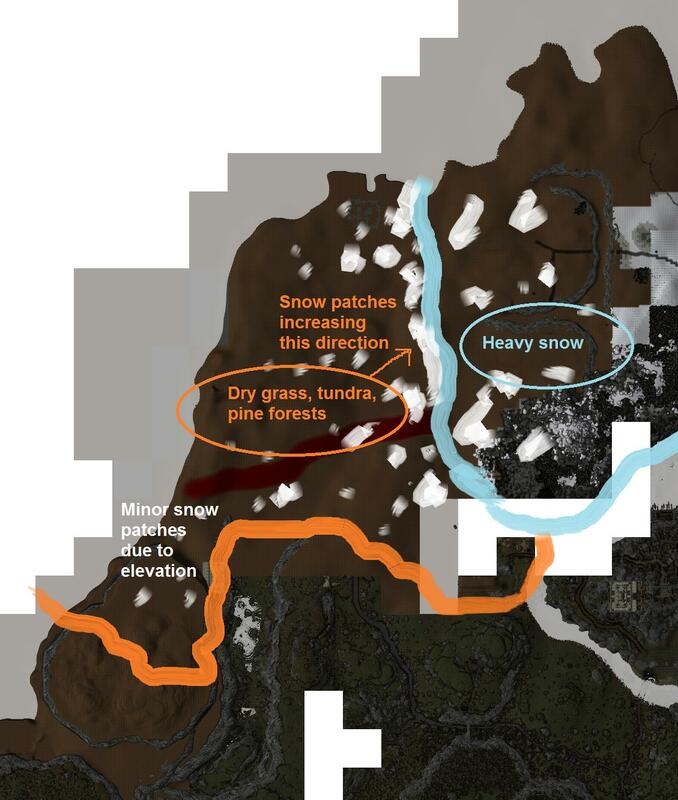 In any case, there will be enough snow in the rest of Skyrim, and it will make more sense there. Reading my earlier post, I admit it sounds very preachy. As a plant researcher with a passing interest in climate mechanics, I take serious issue with TESV's layout where the Rift's heavily wooded plateau is higher than Whiterun's tundra. I have to use the "Great Forest of Whiterun Hold" mod, as the vanilla vegetation map affects my game enjoyment! I think the thought of TESV's bad vegetation map was in the back of my head when I posted previously. I'm sorry if I implied that your creative freedom be restricted or that the real world should be translated directly into pixel form, that's definitely not my intention. I just wanted to give some real world examples to show how much a game's landscape can be made even more diverse (even if they're small things that no one ever notices). I'm not complaining about your landscaping, I enjoy your released mod very much. From my admittedly biased perspective, I think (& hope) that such real-world examples from nature will facilitate & enhance your creative freedoms. Either way, I do look forward to seeing your completed work. No worries, qualified and thoughtful input is always welcome. The worst that can happen is we decide to not use it. I didn't consider it preachy, and I think you put it in a polite way. That said, you'll be happy to hear that White Hold will be a high altitude tundra plateau, and the forests of the Rift as well as Falkreath, will mostly be found in valleys. I'm sorry if I implied that your creative freedom be restricted or that the real world should be translated directly into pixel form, that's definitely not my intention. Nah, I did not take it that way, you shouldn't worry about it. Like I said before, your input is both helpful and welcome, and I'm sure our vision of Skyrim's landscape will be much more satisfying to you than TES:V.
You have no idea how relieved I am by your tundra/forest plans. Thanks! Last edited by dobren on Fri Jan 26, 2018 11:28 pm, edited 2 times in total. Didn't see any thread or mentioning of the entirety of Skyrim's landscape yet so I'm asking if the majority of the province will be snow. I was just watching Zaric Zhakaron's video rant about how Skyrim's design was similar to Oblivion's landscape when it should have been mostly all permafrost like how it's seen on the world map in Arena. It could get pretty redundant seeing snow everywhere, but we could get creative with the type of flora that would grow in snow. Just wanting to get an overview of the whole province's climate. The rest of Skyrim will be much more snowy, but there will be more temperate zones as well; Falkreath Forests (Mhorlan March) and the southern Rift will be less snowy. The rest will have snow in various degrees, i.e. White Plains resembling a tundra. But southeast of Solitude Forest, everything will be at a much higher vertical level, so in the bigger picture it will make sense that The Reach is so temperate compared to the colder regions. It is much, much lower and less mountainous. I haven't played SHOTN in over a year, and I can't remember if we had large farms in the Reach. I remember there were a couple small farms scattered throughout. But isn't the Reach where most of Skyrim's crops come from? I was thinking there should be farms as large as small villages, kind of like in Witcher 3 how some of the farms are just enormous. When you think about it, in TES5, the amount of farms they in the game world could not sustain the population of Skyrim. You could always say they have most of their food imported but it would seem like a cheap cop-out to say everything is imported. And if so, I would expect to see tons of caravans traveling the roads; a lot of whom would not make it to the cities due to bandits. Are we going go have most of Skyrim's farms and crops in the Reach and southern Riften? (Going off of Arena's map of Skyrim). Yes, we have a lot of farms in the Reach, and will have a few in Riften too. The Reach is Skyrim's breadbasket, being one of the only temperate lowland regions in the entire province. It is also one of the reasons that it has been fought over for so long. Is that where the Forsworn originate from; the fighting between the Bretons and the Nords over the land and crops?